One might be forgiven for thinking that, given current political trends, a new public affection for censorship is in the offing. After all, history shows that the Americans who loudly proclaim their dedication to liberty seem to most enjoy that peculiar freedom to squelch ideas opposed to their worldview. The mania for censoring literature comes and goes in public life. But, like rabies, it’s always lurking around. At times, a specific work will galvanize the busybodies. People begin to criticize, to ask what about the children?, to paint dreadful portraits of a nation descending into sin/violence/backwardness/communism/wrongthink. Rosa A. Eberly explores four such moments in the United States, two surrounding censored books, and two surrounding books that escaped the Big Red Pen. She compares the outrage that attended the publication of Ulysses and Tropic of Cancer with the later, relatively quiet reception of the more violent and sexually explicit content between the covers of American Psycho and Mercy. 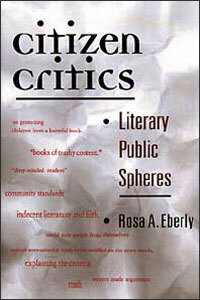 Through a close reading of letters to the editor, reviews, media coverage, and court cases, Eberly shows how literary critics and legal experts defused censorship debates by shifting the focus from content to aesthetics and from social values to publicity. By asserting their authority to pass judgments—thus denying the authority of citizen critics—these professionals effectively removed the discussion from literary public spheres. She also explores the impact a work of literature may have on the social polity if it is brought into public forums for debate rather than removed to the exclusive rooms of literary criticism.